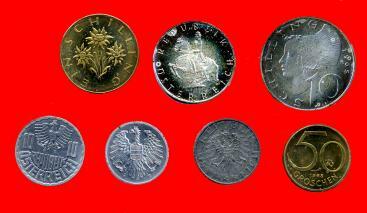 All 8 circulating euro denominations: 1, 2, 5, 10, 20 and 50 cents, €1 and €2. In official wallet. The official 8 coin set in case. 2, 5, 10, & 50 groschen, 1 schilling, silver 5, 10, 25, & 50 schilling. The @5 schilling is the Franz Grillparzer commemorative and the 50 schilling id the Olympic commemorative with a ski-jumper.